This is a whiny post. Feel free to ignore me. 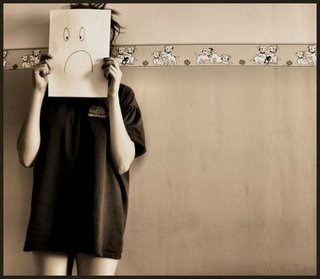 My body is letting me down recently. Maybe I have let my body down. Either is possible, I guess. While much of the last six months or so has been pure NYC-infused joy for me, I have also been dealing with some health concerns. Swollen red eyes. Scaly lips that feel like I spent two weeks in the Yukon Territory without Vaseline or sunscreen. A patch of skin on my forehead that, to the touch, inspires thoughts of a snakeskin purse. A mild but persistant headache. Lots of sneezing and a dry cough, which made me think I was getting a cold, but it didn’t get worse or better. Exhaustion. Not my normal sleepiness either. Had this been a one time thing, I’d call a general practitioner or dermatologist, but instead I’m concerned that this is auto-immune. I should back up a little. There’s more to this story. And as detailed as this post is, I’m skipping parts. January 2011 – I saw a general orthopedist about my still-aching wrist. He called it a sprain and put me in a brace, but said to return in 10 days if it’s still hurting. I returned. February 2011 – I finally saw a hand specialist who finds a fracture in a small bone in my hand/wrist. 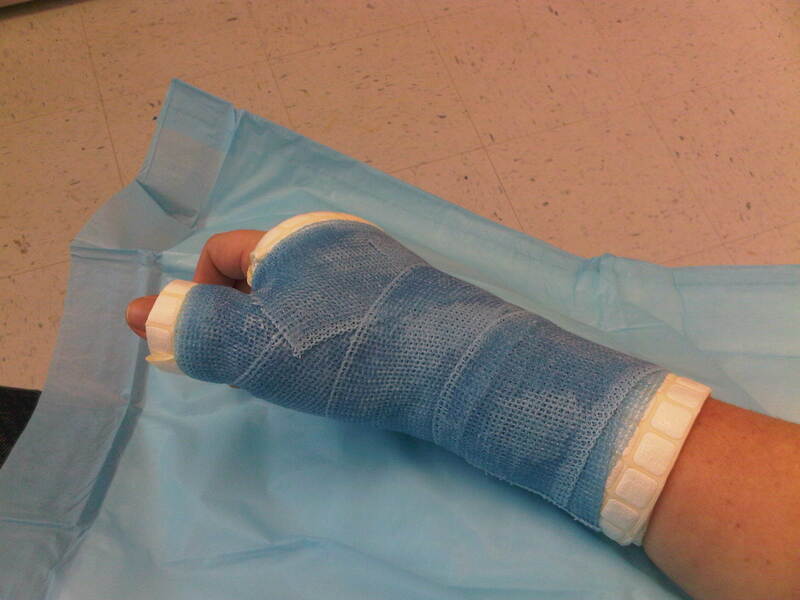 He put me in a cast for a month. After a week, he put me in a longer, tighter cast to keep my [oddly skinny] wrist still. 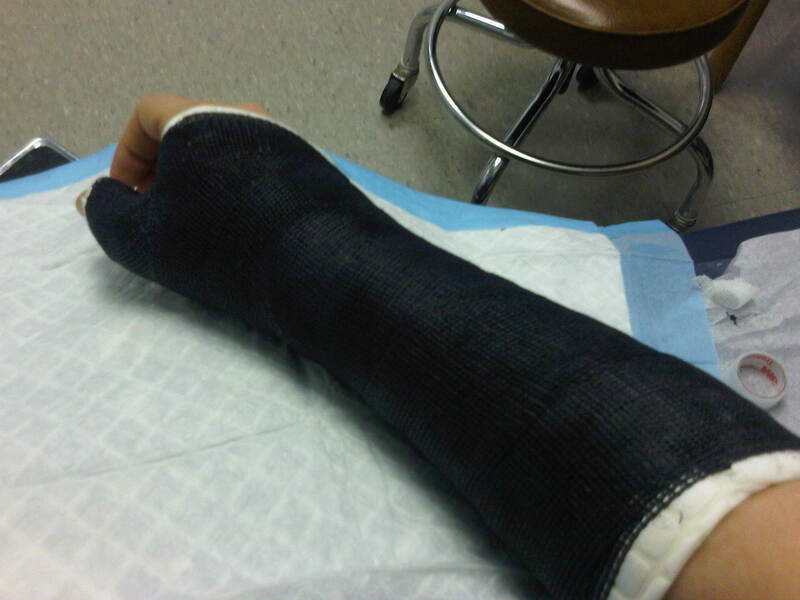 March 2011 – the cast came off, my wrist felt the same. No better. Stiff and painful. The specialist sent me for new x-rays and then physical therapy. Spring – Lori the physical therapist was a total hoot who introduced me to HoneyBadger between time in the dry whirlpool and boring/painful play doh sessions. Another bonus? Her copay was lower. Summer – the physical therapist gently banished me from treatment pending a visit to the doc given the amount of pain I was still experiencing. The wrist specialist ordered more tests, including a bone scan. 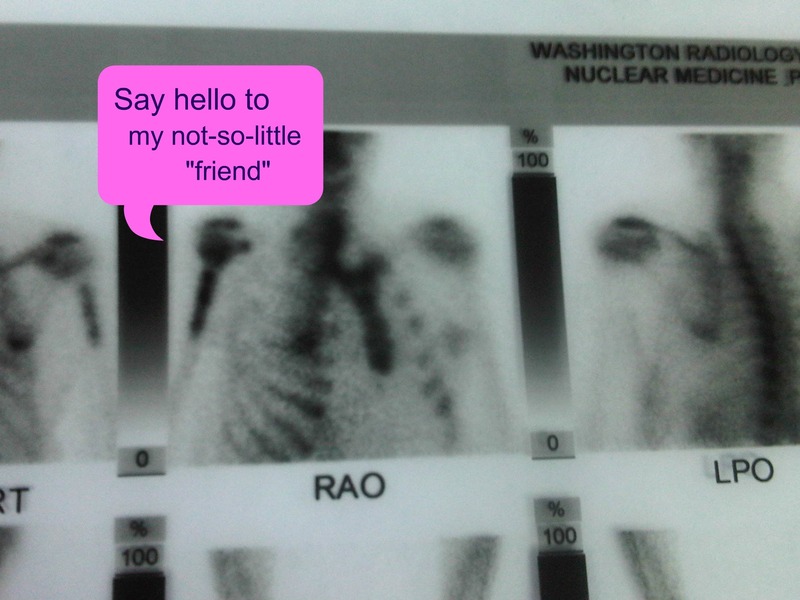 The bone scan freaked people out, particularly the nuclear medicine technician who asked “have you recently broken your humerus?” I told him no. OK, I told him no after I asked him where my humerus might be. He went quiet after that. There’s an 8 cm mass in my humerus. 8.4 cm if we’re being detail-oriented. When I saw the doctor, he chose his words carefully. “Mass” must have been deemed ok in doctor training. “Lesion” too. “Tumor” seems to be avoided at first while the patient (me) gets acclimated. Some sort of autoimmune condition indicated by the radioactive dye they injected during my bone scan forming “hot spots” all over my body in various joints. But we’ll circle back to that. In the middle of all of this, I hunted for an apartment, found tenants for my DC condo, packed, sold my car and cried at inconvenient times. * The tears surprised (and angered) me because I thought I felt like I could handle all of it. Part of the crying was, I think, from the ache of not telling my parents. I had decided to wait until I knew more to share any details. After getting more x-rays and an additional MRI (w/contrast) to be sure, the tumor’s existence was confirmed. I left for NYC equipped with the name of a top orthopedic oncologist with whom my wrist specialist had previously studied. I also had to find a rheumatologist. He did various tests and acknowledges that Something Is Wrong, but he wasn’t sure yet what the diagnosis should be. He said he could either rule out lupus and rheumatoid arthritis OR say that I simply don’t have the full-fledged disease yet. For the short term, he had me take a course of prednisone which made me, well, crazy and stupid. I haven’t gone back to see the doctor since then thanks to the holidays and then an extraordinarily busy January. If you follow me on twitter, you probably know that things are under control [as those things go] with regard to the tumor. All signs point to it being benign, mostly likely an enchondroma. The oncologist, who I have now seen three times, wants to watch it to ensure it doesn’t grow, but doesn’t recommend surgery. Based on the size of the tumor, treatment would be very invasive with a long recovery period–two-to-three months. The doctor also told me it would be almost as invasive just doing a biopsy so…I will get another MRI in August and see the doctor again in September, barring any new symptoms. Last time I saw him, he prescribed Celebrex for some pain I get in my arm. But now, the auto-immune thing has to be addressed. I have put it on the back burner while focusing on the tumor, but it’s time to revisit the aches and pains, the exhaustion, the weird episodes I get. It’s past time. Thanks for listening internet friends. I have surely overshared, but I needed to unload. Update (June 2014): the mass in my arm has remained stable. Good news. * These places included my door-less DC-area office and on an Amtrak train while sitting next to a woman who chose the seat in spite of plenty of empties and my obvious tears. I put on sunglasses even though it meant she couldn’t see me glaring at her, and struggled to refrain from punching her. This entry was posted in Life stories and tagged bone, bone scan, cast, clumsy, enchondroma, fibrous dysplasia, MRI, New York City, nyc, rheumatologist, thyroid, tumor, wrist, X-ray on February 13, 2012 by onechicklette. I don’t understand why they didn’t do the MRI before pt?